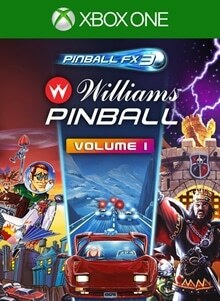 Pinball FX3 - Williams™ Pinball: Volume 1 is a dazzling collection of three authentic classics. Play THE GETAWAY: HIGH SPEED II™, JUNK YARD™ and MEDIEVAL MADNESS™ in two exciting ways -- as arcade-perfect simulations in their original form or as remastered video game experiences enhanced with updated graphics, animated toys, and a host of new features. - THE GETAWAY: HIGH SPEED II™: "Okay, buddy... Pull over... Pull over NOW!!!" Time to press pedal to the metal and shift into high gear! - JUNK YARD™: The meanest game in the whole darn town! Sneak in and rummage through Crazy Bob's Cosmic Salvage. Collect junk and pick up fireworks to build your flying jalopy! - MEDIEVAL MADNESS™: Behold the Renaissance of Pinball! Defeat the king and all his men to stop the madness and restore order to this great land.